Enjoy the Spring with Us! Fishermen, fisher ladies and just plain novices looking for a relaxing and enjoyable time need to check out the longest fishing pier on the NC coast. SeaView Pier is located in North Topsail Beach, NC and offers a variety of enjoyment for everyone from relaxing on our clean beaches to King Mackerel or bottom fishing on our pier. And, while you are here, you can also enjoy our well stocked bait and tackle shop and dine in our clean restaurant. 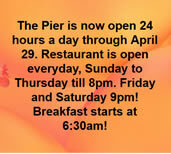 SeaView Pier has the best breakfast, lunch and dinner on Topsail Island. It’s been said that SeaView has the best hotdogs, hamburgers and cheeseburgers around- the secret is the chili. Our beach access is open all summer so you can enjoy putting your feet in the cool Atlantic Ocean. And, don’t forget your beach supplies inside the tackle shop. Suntan lotions, beach towels, umbrellas, body boards, sandals and much more are available to make your beach experience really enjoyable. Our restrooms are clean and open 24 hours. We are a family oriented business and hope the impression we make on you will be a lasting one and you will want to visit us on a regular basis. Thanks for allowing us into your home with this message. We all look forward to seeing you soon at SeaView Fishing Pier.